Murrieta City Council members listen to a staff report about the factors involved in a possible switch to voting districts. 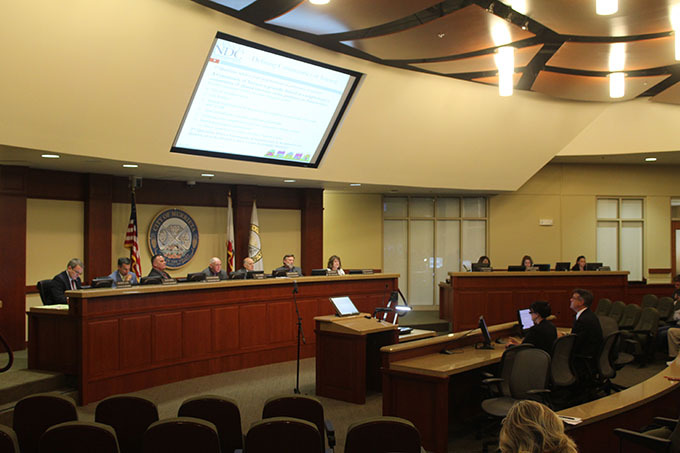 Murrieta City Council members on Tuesday asked the public for patience while they examine the possibility of fighting against the threat of a lawsuit designed to force the City to switch from the current at-large system to a voting by district system. In the first of four required public hearings on the subject, council members repeated the sentiments they expressed during a May 8 special meeting, when they first discussed possible actions in the matter. During that meeting, council members voted to approve a study of the switch to a district system -- only because it bought them time to consider their options. The May 8 action guaranteed the City "safe harbor" protection from litigation for the next 90 days and a $30,000 cap on legal costs if council members ultimately approve a switch to voting districts. However, council members made it clear again Tuesday night that the consideration of such a switch is being made primarily to decide how to react to a letter received from civil rights attorney Kevin Shenkman. Shenkman has prevailed in several lawsuits against other California cities, claiming that an at-large voting system is discriminatory against minorities who run for election. "These are frivolous lawsuits," said Mayor Pro Tem Jonathan Ingram Tuesday night. "It should be up to our residents to decide this, not an attorney in Malibu." And although the other four council members expressed agreement with Ingram, none would go so far as to say they are ready to fight Shenkman in court -- especially considering the potential of a price tag like that of the City of Palmdale, which spent $4.5 million in legal costs, only to lose their fight against a district voting system. In a district voting system, Murrieta would be split into five geographical areas, with boundaries to be determined. Residents would be able to vote only for one candidate among those running in their district of residence. First, council members listened to eight residents plead with them to fight such a legal battle. All said they believe Murrieta is very diversified and there are not geographic minority areas that require their own representation. A map with preliminary data shown during a staff presentation by deputy city attorney Christine Cameron and demographics expert Doug Johnson showed there are virtually no such areas in the city. "This change would limit each citizen's vote to one council member," said resident Barbara Nugent. "Under the current system, we can vote for each one of the open council seats. We need to have one Murrieta, not five little Murrietas." Faye Wons agreed, even suggesting residents come together to raise money to help fight for their rights. "We have 115,000 people in this city," Wons said. "We could start a GoFundMe account. I'm sure a lot of people would be willing to pay a few dollars to fight this. I hope you guys have the guts to say enough is enough." Ivan Cole, who said his wife is one of the protected minority classes, said, "We find it insulting that you guys would not all be able to represent us (in a district system). All this will do is divide us. I realize this is a lot of money, but someone has to stand up to this guy." Warning against immediate action given the safe harbor they are provided in which to decide, council members continued to ask for patience while they evaluate all their options. Mayor Rick Gibbs reminded those in the audience of a budget workshop held prior to the regular meeting in which the City is expected to be facing a deficit within two years. "It isn't about being afraid to fight," said Gibbs. "We're willing to fight -- but I remind you of the old adage that you don't go into a gunfight with a knife. We don't have any bullets, meaning dollars. "If somebody starts a GoFundMe site and raises $5 million, I'd say we've got enough money in our arsenal to take this all the way to the Supreme Court. But only a large group of citizens working together can do that. If at the end of the next three sessions a GoFundMe account has a bunch of money in it, I'm sure the council would consider such action. But the City can't afford to spend millions of taxpayer money. I don't want to see these chiefs (police and fire) have to lay off some of those heroes who provide us public safety." The second of four public hearings is scheduled for the next City Council meeting on June 6. Gibbs urged residents to return and provide more feedback and to "bring your neighbors with you. We want to hear from you."